The River Retreat Cabin sits on the banks of the Yellowstone River in Paradise Valley. The furnished cabin has 2 bedrooms and comfortably sleeps 6. You will enjoy the beautiful view of the Absaroka Mountains and the Yellowstone River from the cabin's deck. 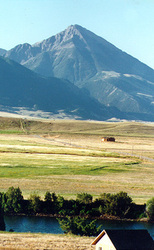 Yellowstone Park's north entrance is only 36 miles south and the world-renown Chico Hot Springs is just 8 miles away. Paradise Valley hosts lots of unique shops and dining, including many art galleries in Livingston. Many outdoor activities are available in the area including hiking, horseback riding, sightseeing, river trips and fishing. Directions: The River Retreat is located 17.8 miles south of Livingston, Montana on Highway 89 south. We are 42 miles from Bozeman, 8 miles from Chico Hot Springs, and 36 miles from the north entrance to Yellowstone National Park.